Success on a global scale by South African IT organisations is a reminder of the remarkable strides of the South African IT industry. It also re-enforces that a committed team guided by a strong mission is a force to be reckoned with in the disruptive world of innovative technology. In just four years, specialist IT security solutions distribution company, IP Soft Distribution, which is headquartered in Johannesburg, South Africa, has made significant inroads locally and internationally and has just been named the Most Active Distributor of Libelium in the world. IP Soft Distribution trumped multi-billion dollar companies in the global IT sector based on a combination of factors, ranging from sales, marketing strategies and actions, to customer support and innovative thinking. Libelium is a world-leading vendor of Internet of Things (IoT) technologies, Machine-to-Machine (M2M), and Smart Cities solutions. IP Soft Distribution became a distributor of Libelium technology for the South African market at the end of 2016. In just one year of commercial activity, it has become a Premium distributor given its rapid evolution in sales and position in the local market. Charl Ueckermann, CEO at IP Soft Distribution, says a South African heart combined with a global mindset and a focus on delivering value-adding innovation are what have contributed to the company’s success over the past four years, as well as pushed it to the forefront in Libelium’s awards programme. 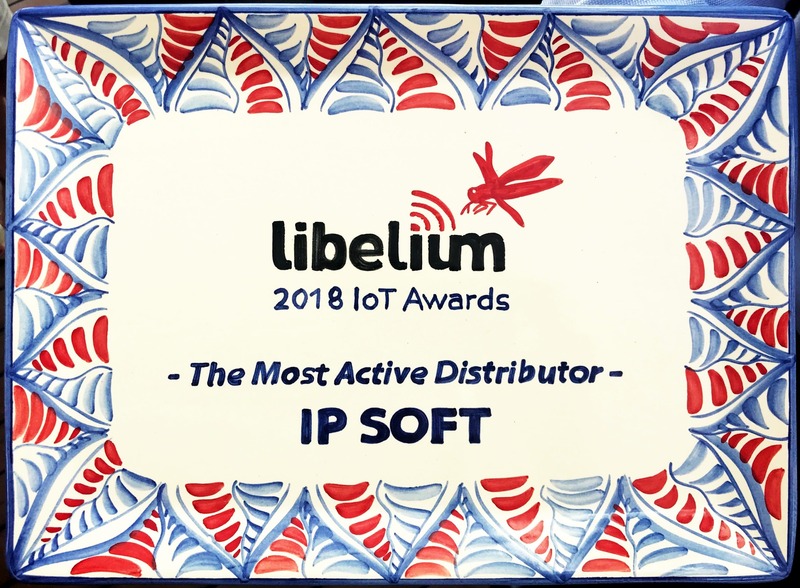 IP Soft Distribution was named the most active distributor for Libelium world-wide on all fronts including sales, marketing strategies and actions, customer support and innovative thinking. “It’s never just about the technology. It is about what you can get it to do at the end of the day. From the outset, we have emphasised out-of-the-boxing thinking to deliver a customised experience to our clients. Our team looks for the most innovative ways to apply technology so that it provides value adding support to address their business needs, improve services and ultimately better the customer experience. “We look closely at a company’s key performance indicators to make sure that the technology side can support an advanced customer experience and ensure that their IoT mobilises their end-products. Ultimately, this assists companies to be more relevant in the future,” says Ueckermann of his specialist and highly agile team. IP Soft Distribution operates in an ever-growing, ever-evolving and highly-competitive space. However, it is distinguished in its approach to create sales and profitability opportunities for software developers and system integrators through unique marketing programmes, enablement services and technical support. In essence, the company offers a single point of contact for specialised expertise and assistance. He believes this is the paradigm shift that is needed amongst local IT distribution companies that sell box products to companies without considering their specific needs or objectives. “For the most part, the technology will work, but it won’t drive efficiency, deliver value or hone the customers’ experience. “You have to be open to implementing global tools and mindsets, instead of narrowly focusing on the what the local market offers. Importantly, you have to consider the business’s objectives and find the most appropriate technology to deliver on those. “Creative thinking is absolutely integral to this. If a company has a business objective to meet – whether it is to redefine the customer experience with timely and relevant communication via an app when a loyal shopper visits a store or whether it is to find a way to automate a process in a factory – you must be able to offer out-of-the-box ideas for problem solving,” says Ueckermann. As an example, he says shops can get customer information by picking up MAC addresses of phones’ or cars’ Bluetooth devices to see how many times a customer visits the store. Once the customer has downloaded the store’s app, the store can share in-store information while the customer is in the store. “This is leveraging IoT to combine real-time technology with real-life customer experiences. Generic technology and a one-size-fits-all approach just won’t cut it,” he says. He concludes by saying that any IT distributor that wants to remain relevant and active in a continuously shifting environment needs to focus on delivering custom solutions that deliver on specific needs.